Here is a collection of twenty (yes, 20) choice mental and psychic presentations, most of which may be performed impromptu with little or no preparation. 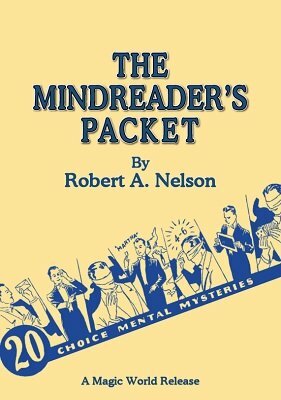 The Mindreader's Packet will enable you to demonstrate your apparent amazing mental and psychic abilities that will long linger in the minds of your audience. MENTAL CARDOLOGY - The mentalist correctly divines the name of a selected playing card, which is placed in his hand behind his back. May be immediately repeated. Ordinary unprepared cards are used and may be borrowed. SPIRIT SLATE WRITING - A very subtle slate writing mystery. A "spirit message" appears on a single slate. No chemicals. No double writing. No magnets or cardboard flap. An ordinary slate is used. You can make this up with your slate for very little cost. THE PERFECT FORCE - You write different names, colors, song titles, etc., on a piece of paper that has been perforated into strips. These items may be called out by the audience. You may show the audience that the words are indeed different. The paper is torn into separate strips, and placed in a hat, cereal box, or other container. The performer reaches into the container (hand shown empty beforehand) and removes a slip of paper, and by touch describes what is written on same. Or it may be predicted weeks in advance and mailed to the party who hired you or a newspaper reporter. PICK THE QUEEN - The psychic projects his will upon the spectator, causing her to select the Queen from among the four face down cards shown before her. All cards are different, no stooges, multiple outs and no marked cards! Plus sixteen more! Nelson sold many of these mind-blowing mysteries separately in his catalog. Now you can pick up this entire collection for far less than you would expect to pay for a single effect. This is an incredibly hard to find original manuscript, printed in the 1930s. If you were able to find one today, you would expect to pay over a hundred dollars or more. Are you a Nelson collector? This was Item Number 552 in the Nelson Enterprises catalog . Now you can fill that missing spot in your collection. 1st edition 1930s, PDF 47 pages.